Copyright 2013, Pacific Pools of Orlando, All Rights Reserved - Florida Builder and Contractor #CPC035670. Welcome to Pacific Pools of Orlando! 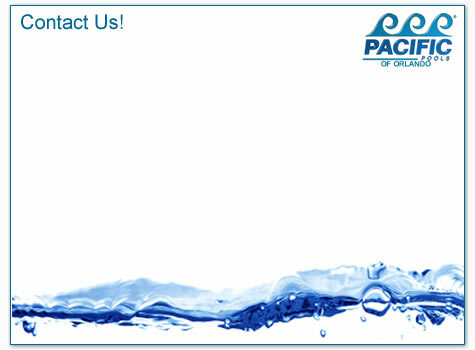 We are a Pacific Showcase Builder of vinyl liner swimming pools and work through the Pacific Showcase Builder program. We build exceptional vinyl liner swimming pools, spas and decks. We also work with Hayward to supply the best pumps and equipment in the industry. Pacific Pools of Orlando is here to help you install a new swimming pool, install a new hot tub or spa, or replace a vinyl liner. New vinyl liner pool construction and vinyl liner replacement areas include Winter Park, Orlando, Ocoee, Clarcona, Windermere, Bay Hill, Lake Nona, Isleworth, Maitland, Kissimmee, Lake Mary, and Altamonte Springs Florida. Certified, Licensed and Insured Orlando Swimming Pool Builder and Contractor.